The big game is right around the corner, and if you’re anything like me, you may be more concerned about the food and commercials than the game itself. Priorities people. Well, don’t worry about the food (heck, don’t worry about the commercials either, no control, haha). 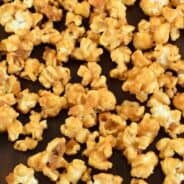 You do have control over what to make, and I’ve got some suggestions. 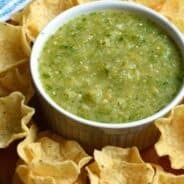 Before I get to today’s recipe for Jalapeno Spinach Queso, let’s talk game day snacks. Obviously, the easier the better, right? Like a batch of these Buffalo Meatballs, or a bowl of delicious Guacamole. I also like something a little heartier, and my go-to dish is this Italian Beef Ring, it’s loved by all! The kids love this Bacon Cheeseburger Braid (well, actually so do the adults). Why not make it all? And of course, don’t forget the sweets. A cookies and cream cheese ball is the perfect dip, and a batch of Chocolate Oatmeal Cream Pies (shaped like footballs) will have everyone begging for more! 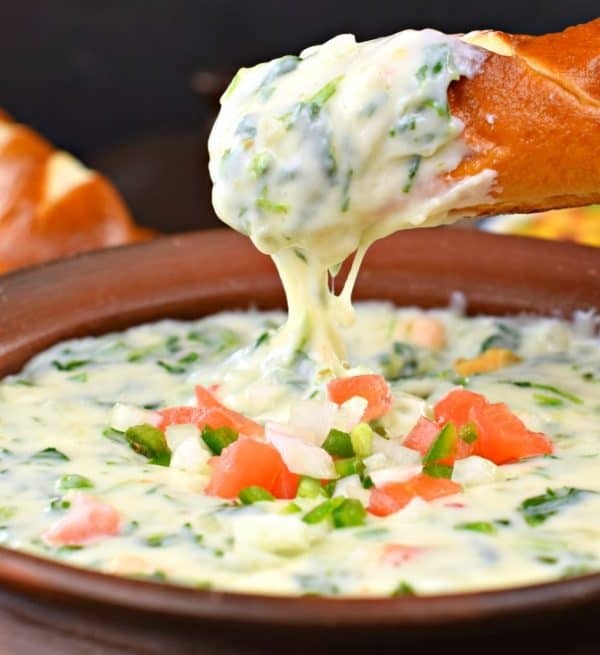 We make fondue every year for New Years Eve, and this year we added this Jalapeno Spinach Queso to the line up. Since we had all the delicious dippers: veggies, bread, sausage, it turned out to be a huge hit! Now it’s going to make it’s appearance on game night too! This awesome recipe came from my friend’s Donna and Chad (The Slow Roasted Italian) and their new cookbook, The Simple Kitchen. This cookbook is awesome. I hate buying cookbooks and only finding a handful of recipes my family will eat. 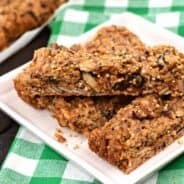 This one, however, is packed with family friendly foods, no crazy ingredients, and they are all SIMPLE. Just like the title suggests. Pick up a copy on Amazon here! 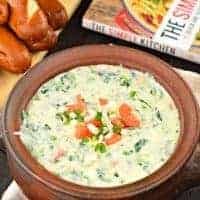 Serve this cheesy Jalapeno Spinach Queso with your favorite dippers, or make a batch of Jalapeno Cheddar Pretzel Twists! We didn’t have time to bake our own, so we just picked up some pretzel rolls from the grocery store and cut them up to dip. OMG such a great side to this dip! Try it yourself! 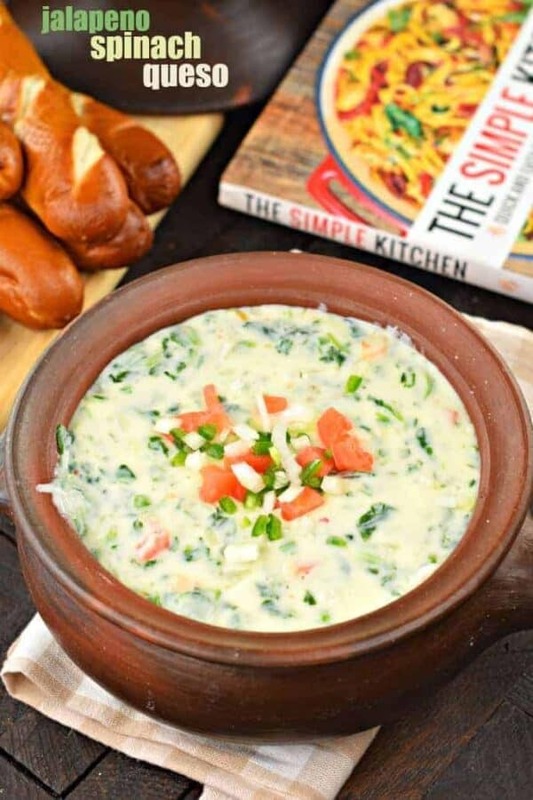 This warm, cheesy Jalapeno Spinach Queso dip is the perfect game day recipe! 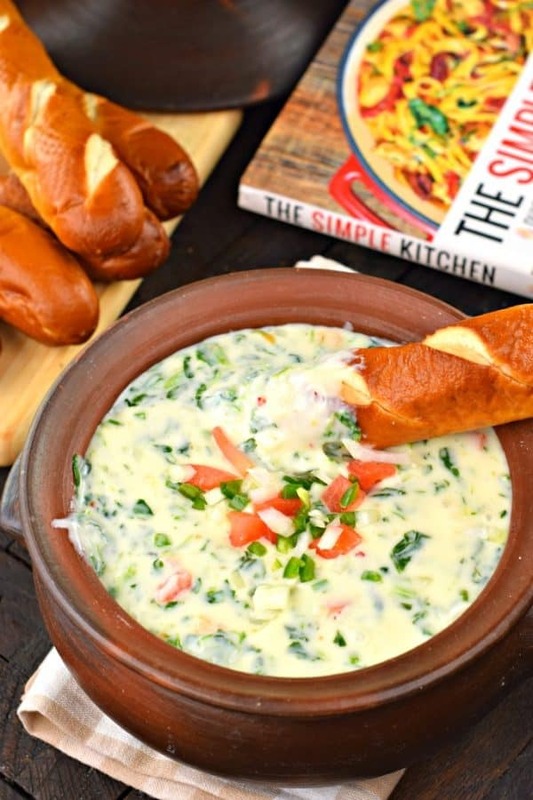 Easy to assemble in one pan, making this dip "party perfect." In a medium saucepan, melt butter over medium heat. Add onion, jalapeno, and salt. Cook until onions are softened, about 3 or 4 minutes. Sprinkle flour over mixture and cook for about one minutes, until thick and evenly coated. Slowly add the milk and cook, stirring until bubbly. Remove from heat and stir in cheese until smooth and melted. Add in spinach and tomatoes and serve warm! We like ours with chips and/or pretzel buns.